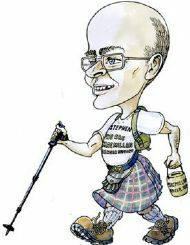 I can't believe it is one year since we started Stephen's Footstep's Challenge on 30th April 2011. For more photo's go to SFC One year on in Stephen's Footstep challange face book page. Pat what lovely memories they were; God Bless you I miss you but never forget you ! YES WE Have DONE IT ! Congratulations to everyone who walked with us, contributed or supported the cause as we are over £10,000 and counting! A Presentation of Cheques to Maggie's & Macmillian Cancer Support ( £5,000 each) took place on Thursday 7th July 2011 at 2.30pm at Maggie's Highland Centre, Raigmore Hospital Inverness. 'ON THE ROAD' Charity single out now. Please buy! Profits to Stephen's Footsteps Challenge. An Inspiration Charity Music Video by Skerryvore On the Road is also available to watch on You Tube. ( It has footage of the last day of the Walk and Skerryvore at the Maggie's Centre Homecoming). Please watch and spread the word! NB. Video DVD / film " On the Road" featuring Stephen's Footsteps Challenge is being premiered at Ardross Film Club on 26th November at 7pm at Ardross Community Hall IV17 0XW, please see synopsis in www.adfc.org.uk for further details. A Coloured Charity Calender with Stunning Scenic Photos of the walk is now available at £ 5.99 each. To Order a calander email me Stephen Mackay on tiggysootypat@yahoo.co.uk or leave me a message in the guest book in this web site. Please contact Stephen is you want him to come and do a illustrated talk about Stephen's Footsteps Challenge any where in Scotland! CANCER EFFECTS ALL OF US AT SOME POINT IN OUR LIVES, WHETHER IT'S OUR ILLNESS TO BEAR OR SADNESS BECAUSE A LOVED ONE HAS IT. At least 1 in 3 people is touched with Cancer in some form during their life. Every two minutes someone is diagnosed with cancer in the UK. Therefore this walk is for all of them and their families. A SPECIAL PERSON ( Stephen Mackay) WALKED ALMOST 200 MILES TO RAISE MONEY FOR THE MACMILLAN TRUST(Macmillan Cancer Support and the Maggie's Centre at Inverness).Find out more in other pages of this web site. Sadly my lovely courageous wife Pat lost have braveand long cancer battle on Friday 10th February 2012. David & Alison Downey are running the Inverness Half Marathon in Pat's memory on Sunday 11 March to raise money for Macmillian Cancer Suppport. THIS IS PART OF THE FAMOUS POEM 'FOOTSTEPS IN THE SAND'. THIS SAYS IT ALL ABOUT THIS WALK. ( " Footsteps of Faith"). You can find other ways that you can follow this challenge and support this good cause. Please make a donation. Go to our links page now! THANKS TO THE MACMILLIAN CANCER SUPPORT AND MAGGIE'S HiGHLAND CENTRE INVERNESS FOR THEIR SUPPORT AND HELP WITH THIS EVENT.